did New Orleans get hit by only Cat 1 force winds? I recently spoke to a friend from Mississippi who insists that New Orleans was never hit for Cat 3 hurricane winds, but only Cat.1. According to her, the levees were already leaking *before* the storm hit. (I also heard that some barge hit one of the levees and that this was never investigated). Does anyone here know what force winds New Orleans actually experienced? Most surface-based observing systems in New Orleans failed, whether due to the instruments themselves blowing away or power going out, before the strongest winds were felt in the city. It is reasonable to assume that they felt at least category 1 from the last observation from the Lakefront observing platform -- http://www.srh.noaa.gov/data/obhistory/KNEW.html -- since at 7a CT they were at 69mph. 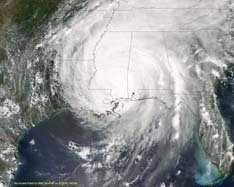 The HRD analysis suggests only category 1 winds, available from http://www.aoml.noaa.gov/hrd/Storm_pages/katrina2005/wind.html, but note that the data is merely preliminary. In other winds...it remains to be seen. Whether or not they were felt any stronger than that doesn't matter a lot; the wave damage with the storm was immense and the two-three weaknesses in the levee system were exploited as a result. I know for a fact on the Westbank that barges hit the levee. When I went there Thanksgiving i saw where one came up on top of the levee. And one was still sitting at the bottom of the levee on dry land. it did tear the roadway up. but I couldn't tell if any was damaged to the point of breaking. New Orleans definitely did NOT experience sustained, Cat-3 surface winds in Katrina. The city was on the weaker side of the storm, and nearly all of the Metro area was just outside (W) of the eyewall. Either way, the evidence strongly suggests that the city did not experience sustained Cat-3 winds at the surface-- as disappointing as that must be to people who lived through that experience. This having been said, winds were much stronger above the surface-- as is very common-- thus explaining some of the heavy wind damage to the upper storeys of some high-rises in the city. From what I have been able to discern, most wind reports for New Orleans when Katrina hit were specifically from the downtown area, and Lakefront Airport. So, it's mostly true that downtown New Orleans (i.e., French Quarter and residential areas surrounding) only experienced sustained Cat-1 winds. However, and this is the main point, the boundaries of the City of New Orleans (Orleans Parish) extend much further east than most people realize. In the Lake Catherine Community near Chef Menteur Pass, which is still technically part of the City of New Orleans, the western eyewall passed directly overhead. A local fire chief I spoke with stayed and experienced winds that he says were easily in the 120-130mph range, sustained, with much higher gusts. As a matter of fact, the Lake Catherine/Rigolets area got it *just as bad as Waveland, MS*; certainly Katrina's Ground Zero. Out of 700 homes in this area, only 12 remained standing, and those were serverely damaged and are presently uninhabitable. For some reason, this is being totally discounted and ignored by NOAA and the press as well. Local residents, and former residents of Lake Catherine (which I must emphasize is part of the City of New Orleans, and Orleans Parish) are pretty outraged at the ignorance of the press and almost complete lack of coverage for this area which is just as much a part of New Orleans as the 9th Ward and Lakeview. In summation, anyone who says New Orleans did not experience more than Cat-1 winds is full of it, including NOAA and the Feds!! Interesting information. Re: the extreme damage you describe in Rigolets (almost all of 700 homes destroyed), was that from wind or water? I think there is unanimous agreement that Katrina was an extreme storm-surge event. The controversy seems to be around the wind speeds. You're right, it was not completely accurate of me to say the eyewall missed New Orleans-- I should have qualified that by saying it missed the downtown area. One question I would have is: Is that fire chief qualified to estimate wind speed? The HRD is known for being extremely conservative in their wind estimates-- but even the NHC only puts Katrina's winds at 110 kt at landfall in LA-- with the assumption being that those were the absolute maximum winds anywhere in LA and probably occurred further S. So 120-130 mph (approx. 105-115 kt) sustained in the New Orleans Metro region would be much higher than what NHC believes to be the case. Either way, it is just amazing that winds weren't higher, given the landfalling presure of 920 mb!! The fire chief from Lake Catherine may not have been officially qualified to give wind speeds, but I trust his opinion since he's been through quite a few big storms, plus he was an eyewitness who experienced the storm in the path of the eyewall. He made an official statement for LC residents and insurance companies, however (he stayed in one of the few homes that survived, which was on 20 foot pilings and built to withstand major winds), and his statement said that the wind took nearly every house down BEFORE the surge came. Since the island was virtually wiped clean, it was because the wind took off roofs and tore down walls, scattering debris everywhere, then the surge came and washed it away. He mentioned watching pieces of houses being ripped off by winds, that fell into some fast-moving water which was about 6 feet above normal-- before the true storm surge came through. The Rigolets area experienced winds in excess of 100mph for nearly five hours before the surge. Judging from the damage, it is also suspected there were tornados or waterspouts that hit the island community. He also said, contrary to non-eyewitness reports, that there was "no gigantic wave" that came and wiped everything out; rather, the water rose and fell rapidly after the eye passed and the wind reversed direction. The water ultimately got on the Rigolets bridge and left grass on the railings, which means the surge at its high point had gone approximately 20 feet above normal water levels. Stories of a gigantic tidal wave moving inland like a tsunami are categorically false. It was more like the water rose and fell very quickly. I recently spoke to a friend from Mississippi who insists that New Orleans was never hit for Cat 3 hurricane winds, but only Cat.1. That is not correct. Sustained winds were very likely below Cat 1 (i.e. NOLA proper never experienced sustained hurricane-force winds).High-rises probably experienced Cat 1 sustained winds for a very short time on the upper levels. NOLA likely experienced some hurricane force gusts, and probably not very many, as they were just grazed by the weak western side of the hurricane. Recall that news crews flew in and were broadcasting from NOLA on Monday afternoon, with not even enough of a breeze to ruffle the hair of the news anchors, during which time the MS Gulf Coast was still experiencing occasional hf gusts, and surge had not yet even receded from inland areas. Areas that were actually on the GOM, like St Bernard and Lake Catherine, likely experienced Cat 1 winds, but that is rather a moot point, as the damage all came from surge (these areas were completely inundated by high rising water...the waves were likely not very high, because no high winds existed to create high waves). Surge probably did rise very rapidly in both those areas. 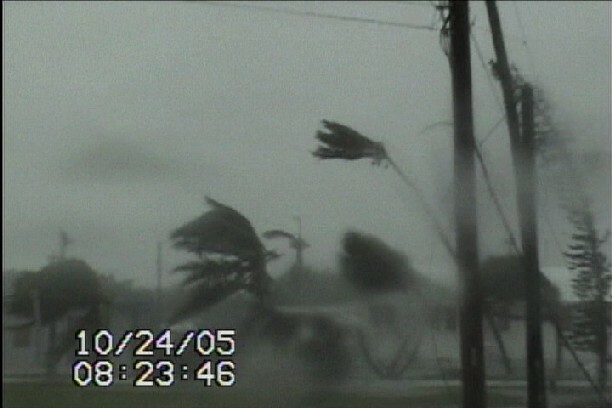 I have spent part of my January finding and reviewing videos of Katrina. What a fun job that was. I think I've gone through several hundred at least by now. Seems like everyone who had a car and a video camera made their own badly-shot video and decided to set the footage to their favorite music (a fairly random and usually not appropriate group of selections). I did find some good ones though, that had clear indications of the extent of wind and wind damage, usually trees, also the height of the waves on the surge. All I can say is that seeing is believing. It appears that Gulfport had the highest sustained winds and these look to be around 90mph, with some gusts over 100mph, and there may have been a few gusts as high as 110 or 120mph, but I did not see a video with any gusts that high. Biloxi's sustained winds looked to be around 65mph, and Pascagoula, around 40-50mph (with higher gusts). It appears that Katrina was very gusty, especially after the peak winds had passed on the coast, and also when the storm went through inland MS.
Wind damage along the MS Gulf Coast, in areas that were inland of the most significant surge, appear to be in buildings that would be susceptible to wind damage (gas station canopies, buildings with a wall of large windows such as an auto dealership) from repeated weaker gusts, rather than one strong gust. There is at least one good example of this on a website that shows successive gusts weakening a building with large windows, where flying debris had broken the windows, and the remaining structure behaved more or less like a tent canopy held down with stakes. There is another video that shows the first floor of a hotel being slowly demolished by gentle waves of surge, which actually remove the metal framing of the doors from the building, among other things, with not a single bit of damage due to wind (most structures are not designed to withstand extremely large side loads that come from moving water, which can exert a tremendous psi). Regarding HurricaneJosh's comment, "it is just amazing that winds weren't higher, given the landfalling presure of 920 mb," that is addressed in the post TC report. Special note is made of it. In summary the wind gradient weakened and spread out prior to landfall. Have also spent a lot of time looking at the surge along the MS coast. I'll refer to it as surge although it is more accurately called storm tide (storm tide includes the high tide, which is between 1 and 2 feet all along that section of coast, along with the surge). It was Cat 3 all the way out to just NE of the Pascagoula city limits, which is around 85-90 miles to the east of the storm's center at landfall. Cat 4 surge was experienced along a very shallow area of shoreline on either side of St Louis Bay. There appears to be no Cat 5 level surge. I am referencing the surge heights from the MS Hurricane Evacuation Study (HES) maps, which used many SLOSH runs to determine worst-case surge heights from the MEOWs. Have been sending a flurry of emails w/Jeff Masters recently regarding the surge. He'll shortly be posting a blog entry that will explain the dynamics of the surge. When Katrina made landfall to the east of New Orleans I was as surprised as any to see it flooded. I have a lot of family in the Baton Rouge area and some second cousins in New Orleans. My sister was at LSU at the time and she said a barge broke the levee. I never saw and still haven't seen the word barge in the media news channels or papers. In need of upgrading and maintance a barge could just have easily broken the decaying levee on a calm winter day. Interesting that it's of such importance to some to assign the right category to the storm. My house has stood through minimal hurricanes and strong tropical storms for many years -- a busy day clearing branches and debris, maybe some minor patching, and we were fine. In Katrina, I lost the four remaining trees, including one on my house, had parts of the house simply blown away, a deck dismantled as if by a giant hand. The house was actually blown off its piers -- all before the water. So don't try to tell me this was a category 1 storm until you take a tour of what is left of my house.